I'm conflicted about my feelings on the Hilton London Kensington Hotel. Overall, I've found hotels in London to be overpriced and underfeatured, but, thankfully, this particular Hilton bucks that trend, at least a little. The hotel is well appointed, has a very good breakfast buffet (one of the reasons I typically stay in Hiltons, especially when on business in Europe), and a "decent-enough" fitness room (although, as is often the case, it's a bit small...). It's also reasonably well located, about 500 meters from the Shepherd's Bush Tube stop. However, the rooms, or, at least my room (no upgrade even though I'm Hilton HHonors Gold...), was teeny tiny; I couldn't actually pull the chair out at the "office desk" because the bed was so close...I literally had to fold myself into the desk to get any work done. Executive Lounge access requires Platinum level HHonors status, where almost every other Hilton with an Exec Lounge gives access to Gold members, as well. Most negatively, there's virtually NO SOUNDPROOFING in the rooms!!! I know way more about the couple in the room next to me than I would ever want to know. Arrrgh. The pros slightly outweigh the cons here, but ONLY slightly. 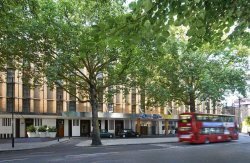 I think several other Hilton properties in/near central London offer a better experience at approximately the same price...try one of them first. Where are the hilton hotels in london?